CloudApp makes communicating with new and existing customers fast and easy. Record your screen, create a GIF or a screenshot, then share in any Drift chat window. CloudApp lets you capture anything on your screen. Use a keyboard shortcut to capture and annotate a screenshot. Or capture a video or GIF interaction in the native Windows or Mac tool. CloudApp automagically creates a unique link after every capture and copies it to your clipboard for fast sharing. Accelerate your customer support by removing the back and forth. Quickly get to the point all right within Drift. Copy a link to any visual directly from the CloudApp native app. Then, paste into your Drift chat window. CloudApp makes it easy to keep a consistent communication experience. 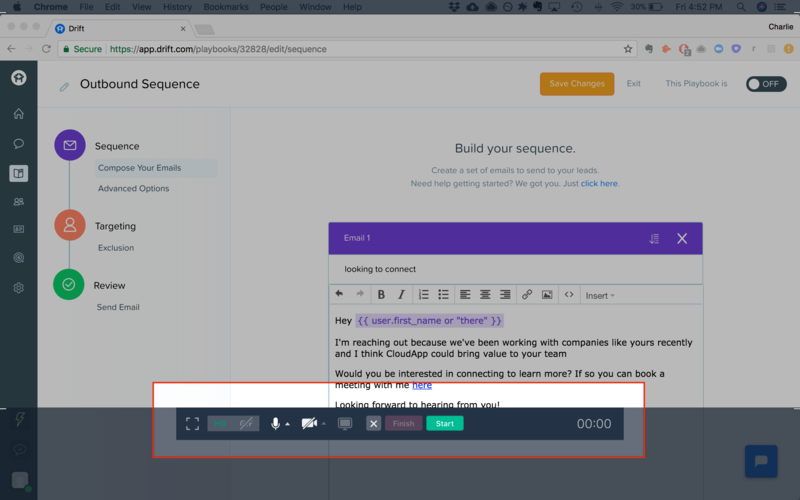 Embed Drift into all your CloudApp visuals and keep the conversation going!